If you have an ecommerce website and you’re not utilising Enhanced Ecommerce functionality yet, you are missing out. 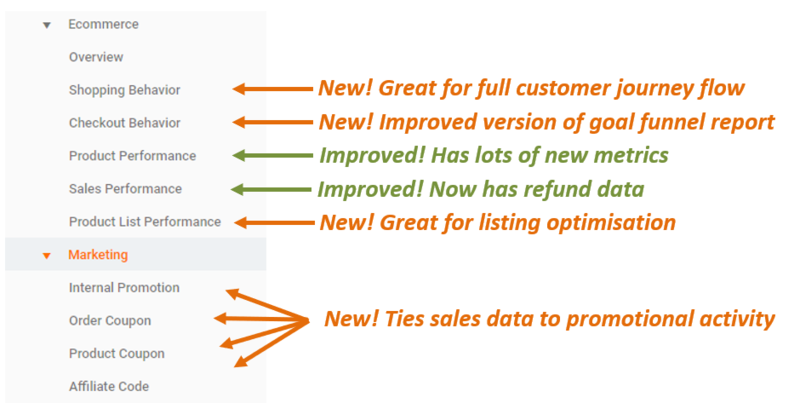 There are many new shopping and checkout insights you can get that were not possible in the standard version of Enhanced Ecommerce along with much cleaner reports, new dimensions and metrics and the ability to segment funnel data. We work with clients to ensure the right tracking is implemented for them, not rushing to implement everything at once but ensuring that functionality is in place for their KPIs, and that once they are comfortable using this data we will then incorporate more functionality to further enhance this. The best way to implement all of this is through the combination of Google Tag Manager and a Data Layer of information on the website. This requires developer involvement but by involving developers you ensure you’re tracking the right data as effectively as possible in a way that doesn’t affect the site performance, as developers will be familiar with your site and how to reference the products in the best way. We work with you and the developers to specify the requirements for the tracking and what code is needed. Once information is available in the data layer we are able to build tags in Google Tag Manager to read this and send it to the right place in Google Analytics. We then carry out tests to ensure the data will work as expected. The Enhanced Ecommerce functionality includes the following, and more. Core elements are explained in more detail below so that you can see what would be beneficial to you and what the new reports look like. The shopping Behaviour analysis report shows you the number of sessions that each stage of the purchase funnel had. This funnel report also shows you the number of sessions that continured from one step to the next as well as how many abanonded the funnel and at which stage. A key metric in this report is the ‘Sessions with Product Views’ metric. This can give you a clearer idea of your conversion rates when a customer actually views a product and what percentage of traffic has intent to purchase something or is on the website for non-purchasing activity. These metrics are the some of the closest you can get to a product level conversion rate and can help buying and marketing teams decide what is getting the right level of interest and what needs more or less marketing activity. This information can also be seen at category level for a more top level analysis of performance. With Enhanced Ecommerce you can also track the checkout funnel on your website, moving away from the vertical green funnel reports used in Goals and allowing more functionality with a table of data and the ability to apply segments to this. The report shows you how successfully your users are moving through the checkout process. It also shows you how many abandoned the funnel and at which stage. This is a great report to see where any weak points in your checkout funnel are. For example you may find that a large amount of people are dropping out at the ‘shipping’ stage. This may indicate that your shipping prices are too high or you are not offering the correct shipping methods for your customers. Knowing what products a user adds to cart, and then removes from the cart can be an indication of intent or interest in purchasing a product. 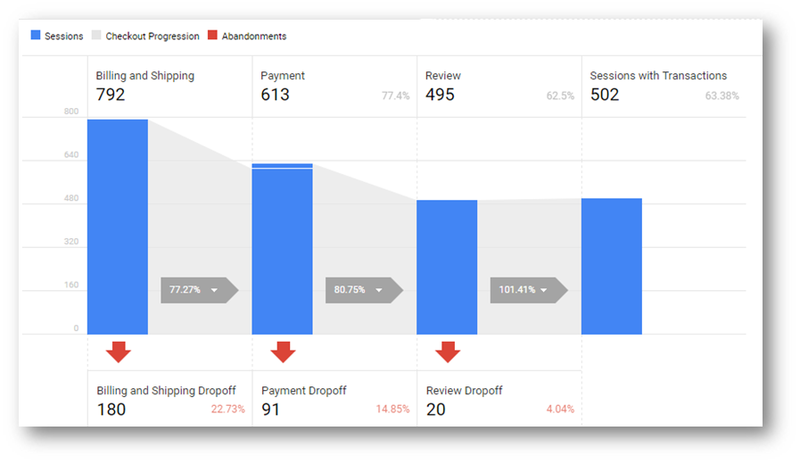 Measuring this helps you see user intent to purchase, which products are generating interest and to track drop outs at the higher ends of the user journey, rather than having to wait for them to reach the checkout before monitoring drop outs as is most often done. By improving the Add to Cart rate, or the success of moving users from Cart to Checkout can have a significant impact on conversion rate as you’re improving results at a position in the funnel with more people to start with than working on improving a step such as the payment page. This data is also crucial for the Shopping Behaviour Reports and other tracking. Enhanced Ecommerce lets you track what coupons a customer has used and can tell you the Revenue generated with each coupon, the total number of transactions on your site that included a coupon being used as well as tell you the average order value of a purchase that included using a coupon.